Having seen JaguarPC mentioned in a positive light at WebHostingTalk.com, we were looking forward to a positive hosting experience. What we got was something less. We found JaguarPC to be affordable and easy to use. Their cheapest hosting plan includes best practices technologies like cPanel, Softaculous, and the CloudFlare content delivery network. However, when tested for server speed and reliability, JaguarPC was found wanting. Disappointed, we checked the test results for different 10-day time periods, but the results were no better. On balance, JaguarPC has earned the NCM Online designation of NOT RECOMMENDED. JaguarPc offers two shared hosting plans: Web Hosting and Business Hosting. Both include a good number of unlimited features including disk space, bandwidth, MySQL databases, FTP accounts, e-mail accounts, and parked domains. Other noteworthy features include daily backups, secure SSL access, cPanel control panel (screenshot below right), Softaculous applications installer, CloudFlare content delivery network, RvSitebuilder, LiteSpeed powered web servers, and free site transfer from your previous hosting provider. The Business Hosting plan adds a dedicated IP address, a Premium RapidSSL SSL certificate, 600% more server resources, a free domain name for the life of your account, SpamExperts e-mail filtering, and PCI compliance. The Web Hosting Plan renews at $6.97 per month for a 1-year term, while the Business Hosting plan renews at $16.97 per month for a 1-year term. Both plans are backed by U.S.-based 24/7/365 phone/chat/e-mail support, a 100% network uptime guarantee, a 45-day money-back guarantee, and an A+ Better Business Bureau rating. 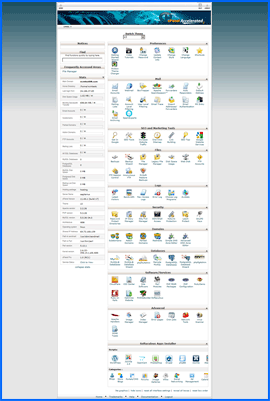 Screenshot of JaguarPC cPanel control panel. Click to enlarge. In order to test JaguarPC for server speed and reliability — and as is our practice — we purchased the cheapest available plan. While not quite speedy, we found the 5-step checkout process to be user-friendly and thorough. After selecting a hosting plan in Step 1, Step 2 provided the option to register a new domain name, transfer an existing domain, or utilize an existing domain by updating the nameservers. Step 3 provides for the selection of a hosting term: monthly at $9.97, 6 months at $8.97, 1 year at $6.97, 2 years at $5.97, and 3 years at $4.97. It also provides the option to select a dedicated IP address for only $2.00 per month (a relative bargain); SpamExperts e-mail filtering at $3.99 per month; ClientExec customer management, support and billing software at $3.00 per month; a dedicated SSL certificate at $29.00 annually; and WHMCS billing and hosting automation software at $6.00 monthly. Step 4 provides the opportunity to review the order, while billing information is entered and a payment method is selected in Step 5. We opted for the PayPal payment option and checked out. The “Welcome” e-mail arrived only seconds after submitting our order and included the client area login information. One minute later, it was followed by the “Order Confirmation” e-mail which provided option and pricing details for our order. Seconds later we received the “Invoice Payment Confirmation” which included a PDF version of the paid invoice for our records. One minute later, it was followed by the “New Account Information” e-mail. It provided all of the information we needed to set up our test site quickly and easily — nameservers, control panel login, FTP login, e-mail server settings, and more (click for sample test site). 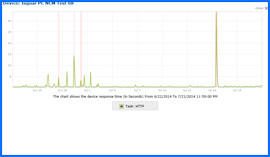 JaguarPC 6/22/14–7/1/14 Uptime Test Results Chart. Click to enlarge. Utilizing the services of Dotcom Monitor, all web hosting services reviewed by NCM Online are subjected to 10-day uptime and page-load speed testing. Beginning on 6/22/14 and concluding on 7/1/14, our JaguarPC-hosted website was checked for uptime and page-load speed every fifteen minutes. Approximately two thousand individual checks spread across thirteen locations worldwide were performed during the 10-day test period. Of the 1071 server uptime checks performed over 10 days, 1035 were successful, while 36 failed. The failures were a mix of TCP 10060 errors (a connection attempt failed because the connected party did not properly respond after a period of time, or established connection failed because connected host has failed to respond); HTTP 12002 errors (the operation timed out); and DNS 12007 errors (the hostname could not be resolved). The problems were not limited to a single day, occurring on 6/22/14, 6/26/14, 6/27/14, and 6/30/14. These failures resulted in a 10-day uptime percentage of only 99.0846% — one of the worst we have recorded to date (see 06/22/14–07/01/14 uptime test results screenshot above right). JaguarPC 6/22/14–7/1/14 Speed Test Results Chart. Click to enlarge. Unfortunately, JaguarPC’s average page-load speeds were significantly slowed by checks performed during the downtime periods. Of the 1012 page-load speed checks performed between 06/22/14 and 07/01/14, 992 were successful, while 20 failed. 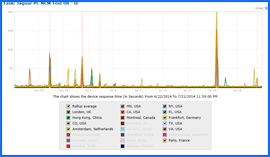 The errors slowed the average page-load speed from the 13 worldwide locations to 4.0719 seconds and 3.7163 seconds from the 7 U.S. locations (see 06/22/14–07/01/14 speed test results screenshot right). These were hardly the type of results we had expected. Because we were so pleased with the other aspects of our JaguarPC hosting, we decided to check and publish the 30-day test results. While this would not help the server speed and reliability ratings — which are always based on the 10-day results — we thought that it might be useful for persons considering the purchase of JaguarPC web hosting. 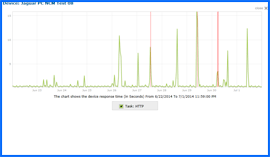 JaguarPC 6/22/14–7/21/14 Uptime Test Results Chart. Click to enlarge. While we would prefer not to dwell upon negatives, the 30-day uptime test results were only marginally better. 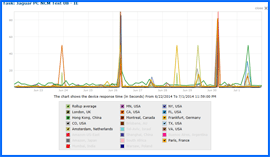 Of the 3068 server reliability checks performed between 6/22/14 and 7/21/14, 2989 were successful while 79 failed. In addition to the dates cited above, reliability problems occurred on 07/04/14, 07/16/14, and 07/21/14; and consisted of DNS, HTTP, and TCP errors (see 06/22/14–07/21/14 uptime test results screenshot right). The 30-day uptime test result yielded a reliability score of only 99.4572%, the equivalent of a two-star rating. Of the 3025 page-load speed checks performed between 06/22/14 and 07/21/14, 2978 were successful, while 47 failed. The average page-load speed during the course of the 30-day test proved to be 3.4518 seconds from the 13 worldwide locations (see 06/22/14–07/21/14 speed test results screenshot below right), and 3.0589 seconds from the 7 U.S. locations — the equivalent of a one-half-star rating. JaguarPC 6/22/14–7/21/14 Speed Test Results Chart. Click to enlarge. Despite a wealth of top-notch features, lack of reliability and less-than-optimal page-load speeds prevent us from endorsing JaguarPC at this time. JaguarPC has earned 3.5 stars and is not recommended by NCM Online. Cheap website hosting company price comparisons based on 1-year term list price before coupon/promo codes or limited time/introductory offer discounts. These are the renewal rates for the second year of hosting. To ensure that you receive the most affordable JaguarPC pricing possible, please visit our Web Hosting Coupon Codes page for current discounts and special offers before making any purchases. Founded by Greg Landis in 1998, JaguarPC has become one the world’s leading shared hosting service providers. As president and CEO of the company, Greg moved the organization’s headquarters from Houston, TX to Colorado Springs, CO in 2010. In addition to Colorado Springs and Houston, the growing firm currently maintains offices in Las Vegas and Atlanta. Presently home to more than 500,000 domains, JaguarPC provides web hosting and programming services to consumers, small-to-medium-sized businesses, non-profits, and government agencies worldwide. With a business model that stresses high-quality, cost-effective internet technology solutions, the company continues to expand its customer base while maintaining the core values that have allowed it grow from a two server operation to a recognized industry stalwart with operations that presently utilize thousands of servers and a diverse staff of technology experts. Utilizing carriers such as AT&T, XO Communications, Level3, Comcast, AboveNet, and Cogent; JaguarPC maintains Tier IV powered datacenters in Atlanta, GA and Dallas, TX. Their network features multiple 10G ethernet connections with 160GBPS capability. The company maintains fully redundant power, cooling, and connective systems; and is staffed by technicians dedicated to providing the most dependable network in the hosting industry. JaguarPC’s current hosting plans include shared, VPS, cloud and dedicated servers, as well as specialized WordPress hosting. This extensive array of offerings provides cost-effective web solutions to meet the wide-ranging needs of individuals and organizations ranging from the smallest start-up to major corporations. To learn more about the firm, visit them online at www.JaguarPC.com. Complete contact information provided below. This video tutorial demonstrates the installation of WordPress on an JaguarPC shared hosting account using the cPanel control panel and the Softaculous applications installer.